I had a not-so-fun but exciting evening on Sunday. My book club was coming over for dinner and to chat about the book we read, Fried Green Tomatoes at the Whistle Stop Cafe. It was a dark and rainy evening and since Michael had been building a fire in our fireplace all weekend, he built one for me to make it cozy. Unfortunately we must have gotten a wet piece of wood or something because it was really smokey. I opened the front door and closed the screen door to air it out a little bit. The screen door was latched but somehow Fat Kitty managed to open it. I realized that the door was open and he had gotten out probably 10 minutes later. I frantically grabbed a flashlight and ran out into the darkness. It was really raining pretty hard and it was so dark outside. My heart stopped for the 10 minutes it took me to search for Fat Kitty outside. My mind was racing. He’s my baby. I cannot imagine what my life would be like without him in it. He sleeps next to me, purring, every single night. Anyways, where we live there are a ton of places for him to get stuck or hurt. There have been cougar sightings in the woods by the house and a neighbor’s dog was even killed by one at some point. So you can imagine my panic. There’s also a creek and forest/blackberry bramble behind the house. Our street can be busy with cars, and there a plenty of stray cats in the neighborhood that can be mean. My mind was going to all of those horrible possibilities; then I saw a flash of movement in the darkness. Then Fat Kitty and I played the “chase me” game–where he just darted back and forth between bushes and hedges in the yard, trying not to get caught. He’d run up to the front door but it was closed and I’d try to grab him but he’d race by me back into the darkness. It was horrible! Finally, I put Bella in her crate and left the front door open and Fat Kitty raced inside the house and immediately hid under the bed. All in all, it turned out okay. He wasn’t hurt and he was safely back in the house but goddamn that freaked me out! Poor baby was scared to death, too. I saw later when he came out from under the bed that he had a scratch above his eye that was bleeding a little bit. I think it was from the bushes. It wasn’t a cut and it looked okay the next day so I didn’t think a vet visit was needed. I kept checking on it that it was healing and not getting infected. My book club came over and I made us dinner. 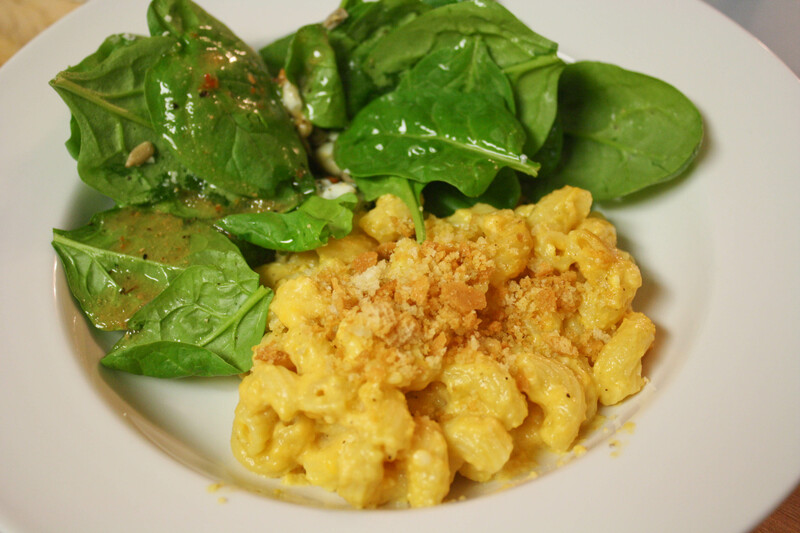 On the menu: crockpot mac n’ cheese! 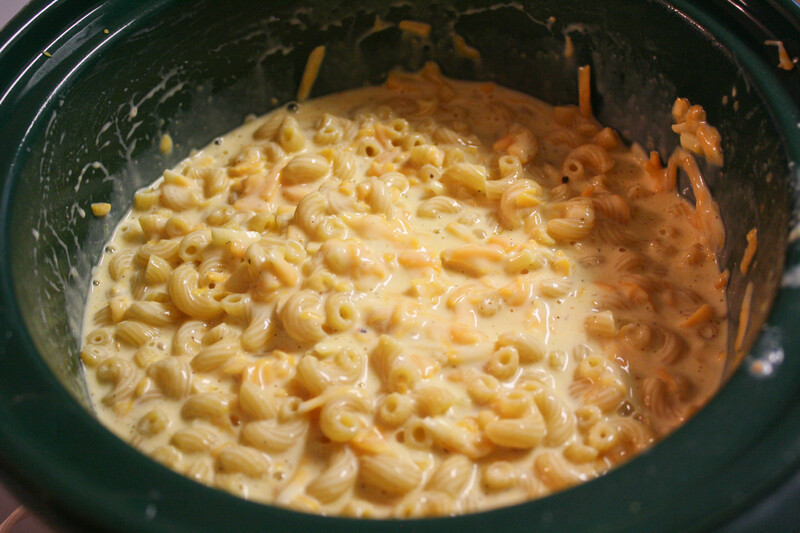 I’ve wanted to make mac n’ cheese in the crockpot for awhile but hadn’t found a recipe that I really liked. Either there were too many ingredients or too many calories. Something always deterred me from trying. I decided to finally give it a try. Cook macaroni noodles according to package directions. Drain. ( I usually slightly undercook them - until barely al dente). 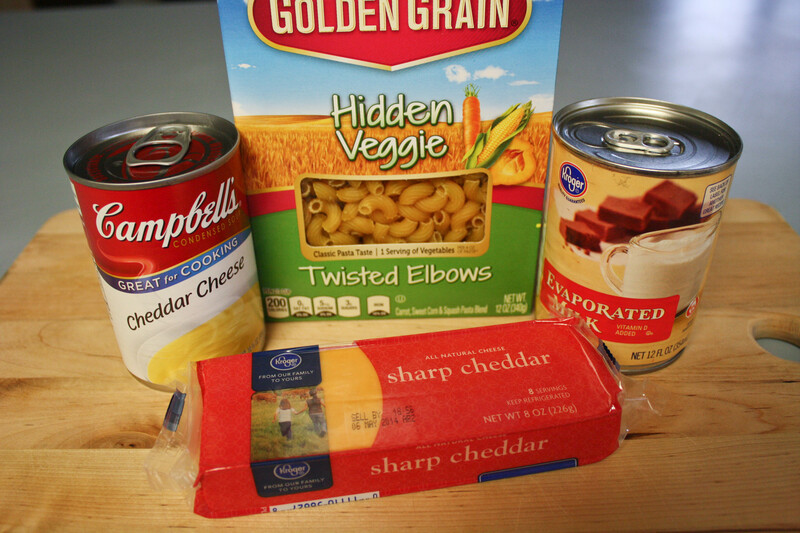 While noodles are cooking, combine soup, cheeses and milks in a crockpot. Stir to combine. Add cooked, drained noodles and stir well. My only complaint about this recipe is that it required cooking the macaroni first. I skip most crockpot recipes that require any kind of work beforehand. The point of a crockpot is to throw everything in it, turn it on and leave the house for the day. I made a roast in the crockpot once and while the end result was delicious, I was super annoyed that I had to pan sear all the sides of the roast in a skillet at 6am when I was half asleep. Again, the point of a crockpot is that it is EASY. 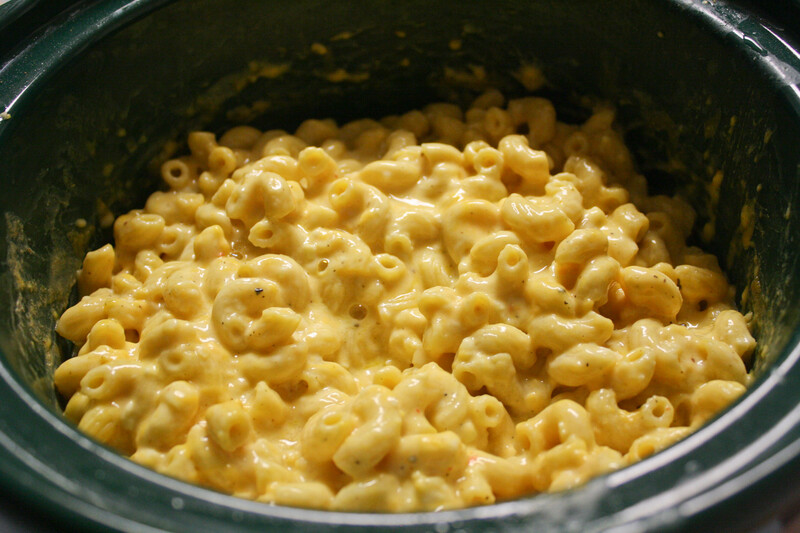 I spent a good hour looking at at least twenty different versions of crockpot mac and finally settled on this one because it had good reviews and only a few ingredients. Even though I had to cook the macaroni first, it was still really easy to make this. Some of the other recipes I looked at either had a ton of ingredients (that I didn’t have), or I had to cook the macaroni AND the cheese mixture separately on the stove before combining it, or called for several eggs to be included in the recipe. Most of the recipes that called for eggs had bad reviews–they said that the egg made it into some kind of weird congealed egg-quichey type dish. Not what I was looking for at all. And cook on low for about 3 hours. I added a little bit of dry mustard into the mixture. It was pretty creamy in this “semi-cooked” state. After two hours it was pretty thoroughly cooked. I stirred it every 30 minutes or so (and might have sampled a few bites to make sure it was edible). My friends came over for the book club and dinner was served! I made a spinach salad to go with the mac n’ cheese. The mac n’ cheese was hot and creamy. It was flavorful and delicious. This is definitely a recipe I’d make again. I’d probably make a few tweaks. I used three different cheeses: sharp cheddar, about 1/4 cup of white cheddar, and the rest of Colby Jack. I think next time add a little extra sharp cheddar too. I sprinkled some dry bread crumbs on top of the mac. This would be a great recipe to prepare for a family gathering. It made about 8 servings for me. We settled in next to the fire, ate dinner, Bella fell asleep on the couch in between me and one of my friends 🙂 and we discussed the book. We all sort of liked it in varying degrees, but we all agreed that this was a case where the movie was better than the book! I’m so glad you found your cat! That must have been really scary! I can’t even imagine. 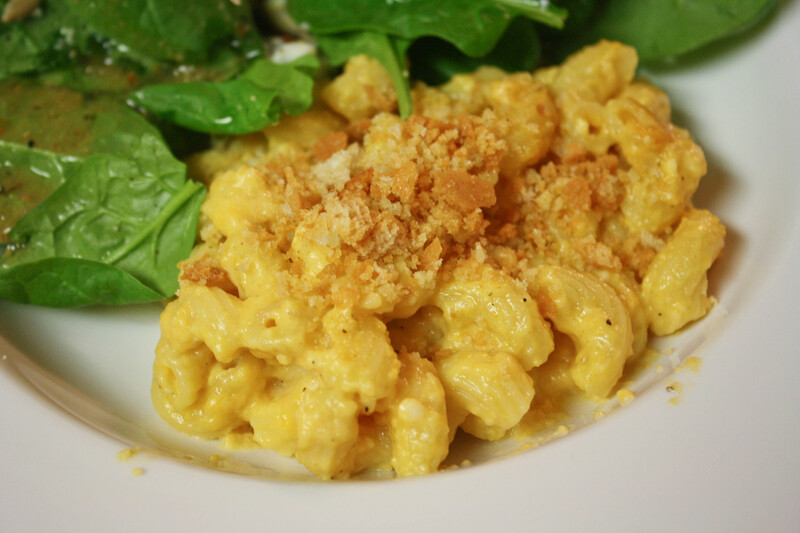 Your mac & cheese looks so delicious (even more so because I’m hungry and haven’t eaten lunch yet!). My mom just gave me a slow cooker and I’m so excited to try it. My coworker said his sister in law even makes cakes in her slow cooker! I think I’m going to start with chili! I’ve heard of people making bread in a crockpot. I’m not sure how that works but it sounds awesome. So does cake! “I frantically grabbed a flashlight and ran out into the darkness.” This blog reads like a suspense novel. Thanks for the mac recipe. Never thought about cooking it in a crockpot. Printing the recipe now. I’ll try it this weekend! Oh no Fat Kitty!! At least it ended well! That mac and cheese looks really tasty. Thanks! He’s doing ok. the scratch has healed and he seems back to normal. Please share recipes for mac and cheese. and carbs,fats,fiber,protein, so I can figure out WW Points. It’s great for figuring out calories in recipes. I cooked our thanksgiving turkey in a large crock pot for the last two years. It is wonderful. I have made mac and cheese in the crock pot without cooking the mac first. It works if you add an extra cup of skim milk and stir every half hour. You cannot leave it all day without stirring. Jane recently posted..Is Everyday a National Food Day? Wow! Impressive! I like the idea but I would need a bigger crockpot. Mine is pretty small. Good to know about uncooked macaroni. I will try that next time. So glad Fat Kitty is okay! So scary! Glad to here that Fat Kitty is ok! I used to live down the road from the Whistle Stop Cafe in Juliette Georgia that was featured in the movie. It looks just like it was shown the movie and is open as a cafe. For some reason I was never there when it was open, so I’ve never eaten there. Lots of people would show up on the weekends though and I heard the food was good. Yum – that mac-n-cheese looks delicious!!! Kim recently posted..Names – How do you Choose Them? AWWWW!!!!! Fat kitty!!!!!! So glad all is well that ends well. I so understand the racing heart if pets get out. Awww! I am so glad he’s okay and everyone is safe! Let me know what you think! The leftovers were tasty but not creamy anymore like they were when I first made the dish. I make things for the crock pot the night before. Brown the meat (it makes such a difference with beef and pork), chop the veggies, assemble it all in the crock. Then I put it in the fridge overnight. In the morning I put it in the slow cooker. No cooking at 6 AM. My friend Lisa gave me her recipe for crockpot mac & cheese and you don’t have to cook the pasta ahead of time. It’s awesome. Spray our crockpot insert with Pam. Combine the milks, egg, spices and mustard, pour into pot, stir in the cheese and pasta. Sprinkle the mixture with the parmesan and cook on LOW for 3.5 to 4 hours. DO NOT cook longer or you’ll get burned dried out mac and cheese. Smart! Good idea on doing all the prep the night before. I will try that next time. And thanks for the recipe. I will give it a try!